Have seen a modest increase in the bite of late. Many of the tog we've caught have a pale appearance - I think they're just waking up. Have swung for the fence & struck-out. Have kicked around down-home & done OK(ish). Even broke one guy's new boat-record 3-trip skunk with a limit on Saturday. I won't mention any names, but you better believe when Alex can't catch them; fishing's really, REALLY, tough. And it was. Hardest I've seen. Loosening up now it appears. A little. Warmer. There are still pockets of cold water though. They Move! When sea bass were closed by Emergency Regulation in 2009 a lot of sea bass effort shifted to tautog. It remains a very real & sustained pulse of new effort. Keepers from early in that sudden uptick in fishing effort, and especially the 20-some inchers from then, would be today's jumbos. We had the same thing, but on smaller scale, in Maryland's coastal bays when summer flounder were closed by emergency in 2008. There truly is an emergency in recreational saltwater fishing. It's management's REQUIRED use of recreational catch estimates no matter how inaccurate they are. I believe the good news is many in management see these estimates for what they are. We've now created a system that applauds & approves Rhode Island's 8 fluke & 4 sea bass regulations, when even those on the inside wonder how that came to be..
A very bad system. It begs repair. Many more now see the need. I still do not have a contact for your comments on MRIP to the National Academy of Sciences. I will though. 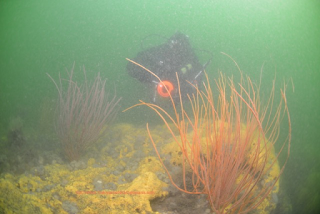 The truth of HABITAT in our task in fisheries restoration, however, cannot be evaded forever. We don't need fluffy rhetoric & pretty smooth glossies telling us of NOAA's imaginary accomplishments. In order to take the idea of "Fisheries Restoration" to a new level, we need coral & oysters in grand scale derived from rocks/concrete deployed as reef substrate. We need solid management strategies more easily developed with honest recreational catch data. We need close examination of past successes in reef fish, even though previously ignored as 'an accident,' so that management can learn how utilize spawning potential..
See letter to management below. To reef, or not to reef..
What an odd world we've created in fisheries. The MuRFSS Massachusetts private boat cod estimate (with all releases suddenly counted as dead discard) in March/April 2010 would have been a little over 14 million pounds killed by small plastic boat owners; when most of their craft were still in storage. It's among rec-fishing's worst estimates ever. Perhaps the title holder.. Yet that estimate's part of a picture seen by management at all levels. You REALLY need to unmask that bandit. Bad rec catch estimate data is stealing science & policy's potential in ways you cannot imagine. This pic is from a small rockpile about 20 nms east of Ocean City, MD in 115 feet of water. I first thought it a natural calving from long-ago iceberg, but my friend Nick Caloyianis (a scuba diver w/40? years underwater filming for NatGeo & Discovery) thought it more likely they were jetty boulders lost from a small barge-spill. When sessile organisms colonize, (corral, mussels, bryozoans) it's a safe bet they cannot tell whether their hold-fast has attached to natural or artificially placed substrates either. In need of shelter, food, & a place to spawn; fish have no idea their habitat's history at all..
See California Fish Bulletin 146, Man-Made Reef Ecology: Summary & Conclusions -- Page 198 (published in 1961) -- that study held an artificial reef's brief period of attraction was followed by natural production. But somehow management --upper management-- is supremely reluctant to adopt reef building as a way of bolstering fish populations. Up & down the coast are many tales of habitat lost as industrial fishing took its toll on virgin seabed. 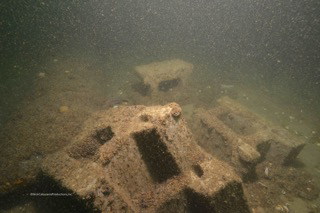 Up & down the coast are numerous tales of new fisheries production occurring on newly built artificial reef. An incredibly powerful tool in fisheries restoration is sitting there like Geico money. It's really that simple. 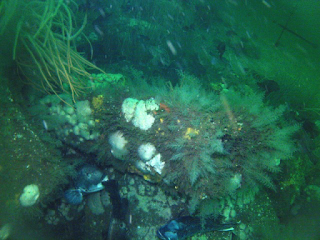 If we took the most banned bottom paint---the most poisonous anti-fouling paint ever in existence, and painted a bargeload of boulders ..the most you could do is delay coral colonization a few years compared to unpainted rock.. Counting estuarine reef, I cannot think of any species that wouldn't benefit from a strong federal reef program. Even at the idea's furthest reaches, say tunas & billfish; those species are in NEED of reef restoration. Because squid spawn on hardbottoms (and were once known to spawn prolifically inshore) -- and because Mid-Atlantic ocean water quality has been in a nose-dive since the oyster's collapse; it's entirely possible the benthic/pelagic coupling is your strongest reason for an invigorated reef program. Tires roll around the seabed and wash ashore, even today after a hearty storm, owing to a failed program from the late 1970s. Tire reefs were WAY more about helping big business with a huge problem--a (literally) mountainous problem, and reducing mosquito populations. Here's what it could have looked like if they'd been engineered correctly, if they'd used concrete & rebar instead of quickly-rusted steel bands..
Yup.. No manager thinks ANYTHING grows on tires. I believe they're the BIGGEST REASON today's top managers distrust reef building. I promise: poor engineering altered the course of history. Here's an idea: Take what you want of Carlos Rafael's fishing boats for research vessels, then clean the rest up for reefing. Anchor them 18 NM east of Ocean City, MD and tell our local Warthog squadron they're going to have a homeland security drill. Or, perhaps the folks at Wallops Island have clients wanting to test anti-ship missiles..
Bargeloads of boulder are sooooo boring. At my urging, the MD Artificial Reef Committee funded a nearly-$100,000.00 load of giant boulder for deployment north of the Chesapeake Bay Bridge: Yawn. Perhaps in your line of work, however, a yawn is much better than many SCREAMS. Some of the places we drop them have over 3,000 blocks. Soon the earliest ones, from about four years ago, will have coral growing on them. (These in pic are just a couple weeks on the bottom.) We just got another delivery yesterday. Have about 12,500 on the bottom now. Last year our little non-profit deployed over 100 truck loads of miscast concrete. It was a great year. But when I leave the inlet - damn that's a big ocean. When we filmed rocky bottoms near the Washington Canyon in 50 fathoms last summer (prime blueline habitat) we discovered those rocks are not at all special. They're just rocks with stuff growing on them. If we took more rocks out there we'd soon have more 50 fathom reef. You can't stop it. Ever clean a boat's bottom that had bad bottom paint? You could place transportable reef units near spawning colonies of any sessile growth desired, from bubble-gum coral in 150 fathoms to inter-tidal oysters, and then move those units to areas where you want to accelerate colonization..
What tires could have done, rock & concrete will do better. Restoring lost hardbottom-habitat fisheries production is ABSOLUTELY as simple as rolling rocks off a barge. Actually maximizing fisheries production, however, will not be as easy. You'll have to employ population biology, plus get rec-catch estimates hammered out. Then it will be easy. So easy, I truly believe some species can be taken to any population management desires. It was in 2003, after all, (when I wrote & thought our region's sea bass were at Habitat Capacity,) that I realized the only way to further increase such a population would be through increased reef habitat. Lot of ocean out there. Yet we live in the land of can't. ..and possibly the most damaging because sport 'out-kills' trawl for the first time in the data because ALL RELEASES WERE COUNTED AS DEAD TOO!!! Unfortunately, I did not save POUNDS. This 1.5 million cod catch would have been converted to pounds to determine recreational impact. Because "all recreational released cod" suddenly counted as dead discard/release mortality, even the MRIP estimate that MAY have been used by managers would have been 1,532,000 pounds & not the 778,000 pounds MRIP shows. It's approximately 1,530,000 pounds too high..